This paper provides a brief research background on the field of alternative staffing and what we have learned about connecting job brokering activities with training and education opportunities. 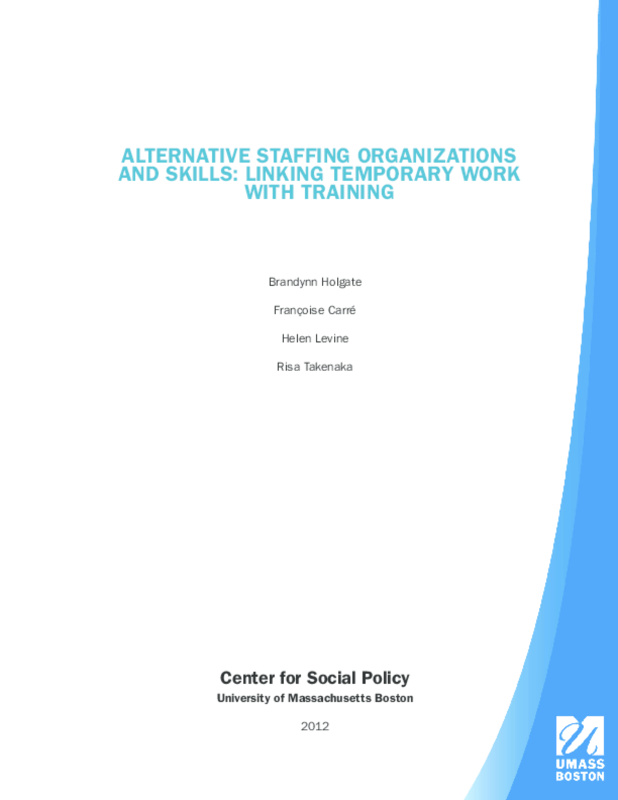 This includes drawing on recent research by the Center for Social Policy on the Alternative Staffing Demonstration II, 2008 to 2011, funded by the Charles Stewart (C. S.) Mott Foundation. The paper also offers several points for consideration in connecting temporary help workers to training opportunities. Specifically, it puts the role of alternative staffing in the context of the entry-level job market and discusses the value of staffing services from the perspective of job seekers, customer businesses, and the workforce development field. A number of examples are provided of training programs and partnerships that combine skills development with job brokering. Overall, we address two questions: 1) What do we know about connecting staffing services with training opportunities?, and 2) What are some promising examples of connecting ASO workers to skills training? Copyright 2012 Center for Social Policy at the University of Massachusetts-Boston.